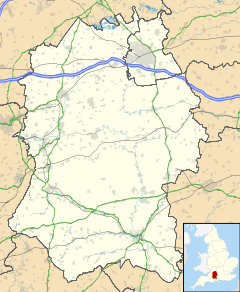 Bromham is a village and civil parish in Wiltshire, England. The village is 3 1⁄2 miles (6 km) northwest of Devizes and the same distance east of Melksham. Besides the main village of Bromham, the parish includes six other settlements: St Edith’s Marsh, Westbrook, Hawkstreet, Netherstreet, Roughmoor and Chittoe. These are sub-villages and hamlets all within 2 miles (3.2 km) of the main village centre, thus 'greater Bromham' is geographically extensive for a village of its size. It stands 1½ miles north of the Kennet and Avon Canal and 1¾ of a mile south of the Roman road leading to Bath, Somerset. In Anglo-Saxon times the manor was held, in the reign of Edward the Confessor, by Earl Harold Godwinson. Under the Normans there were two manors covering Bromham. Bromham Hall, later called Bromham House, the manor house of Bromham Roches, stood to the east of the Devizes road; it was burnt by royalist troops in May 1645, during the civil war. The small village of Chittoe is about 1 mile (1.6 km) north of Bromham. The area was a detached tithing of the ancient parish of Bishops Cannings until 1883 when Chittoe became a separate civil parish, taking some land from Bromham; in 1934 the parish was merged into Bromham. The Church of England parish church of St. Nicholas, in the centre of the village, is from the 13th century and is a Grade I listed building. The church has fragments of its 12th century predecessor, and was extended in the 14th and 15th centuries. The tall spire is from the 15th century. Towards the end of that century an ornate south chapel was added by Sir Roger Tocotes and Sir Richard Beauchamp; Pevsner describes it as "the feature which makes a visit to the church memorable". In the 16th and 17th centuries several members of the Bayntun family were buried or commemorated in the chapel, thus it became known as the Bayntun chapel. The churchyard has the grave of Irish poet Thomas Moore, who had long resided at Sloperton Cottage, north of Bromham. Bromham Methodist Church was built in 1799, on Church Hill below the parish church and enlarged in 1815 and 1880. As of 2016 the church is still in use. A Baptist chapel was built at Bromham in 1873, replacing an earlier building of 1828. The chapel closed during the Second World War and is now a private house. Primitive Methodists built a chapel in the centre of Chittoe in 1840. Enthusiastic singing by the Methodists could be heard from within the Anglican church after it was built nearby, so in 1882 the chapel was dismantled and rebuilt at Chittoe Heath, not far from the Devizes road (now the A342). A schoolroom was added at the rear of the chapel in 1914. As of 2016 the chapel is still in use and is served by the minister of Melksham United Church. The Church of St Mary, Chittoe, was erected in 1845. Previously the hamlet had been a detached part of the parish of Bishops Cannings and villagers had to travel there for marriages and burials, using a trackway called the "Burying Road". For burials this requirement was relaxed at the end of the 18th century, but weddings were still conducted at Cannings until the new church was brought into use. In the 1980s the church and vicarage at Chittoe were converted to private residences. The parish has three Grade II* listed houses. Battle House, named for the manor of Bromham Battle, held by Battle Abbey, is partly 15th century, largely rebuilt c. 1760; it was the home of the historian Sir William Napier between 1826 and 1831. Spye Arch, at the top of Bowden Hill, once served as gatehouse to Spye Park, a seat of the Bayntun family. It had originally been constructed in the 16th century as the gatehouse of the Cistercian Stanley Abbey, which stood near the eastern edge of the parish, towards Chippenham; the Abbot's Wood that appears as a block of woodland in Andrews' and Dury's Map of Wiltshire, 1773, survives as a narrow wooded strip south of the village. Nonsuch House, north of Bromham village on the road from Melksham, is from the early 18th century. Bromham is a civil parish with an elected parish council and is in the area of Wiltshire Council, a unitary authority. The councils are responsible for different aspects of local government. The village falls in 'Bromham, Rowde and Potterne' electoral ward. The ward starts in the north at Bromham and extends south to Rowde and eventually Potterne whilst avoiding Devizes. The population of the ward taken at the 2011 census was 4,850. St. Nicholas Church of England Primary School is in the village. For secondary education, Bromham is in the catchment area of the John Bentley School in Calne. For many years there were two schools in the village. The first school opened in 1832 and moved into a new building (still the site of the present school) near the church in 1867, becoming a National School. Children of all ages attended until 1938, when older pupils transferred to Calne; the school became Voluntary controlled in 1948. The building was extended in the 1960s and again in 2004. A Nonconformist school was established in 1843, and in the 1860s became a British School in a new building to the east of the village, near the Devizes road. The building was enlarged in 1901, then was transferred to Wiltshire County Council in 1907 and was known as Bromham County School. Pupil numbers declined until two schools were no longer necessary, resulting in closure of the county school in 1984. Its building is now a private house. Bromham has a village shop and a family butcher's shop. The village has two playing fields. The Pound Playing Field has the village's tennis court, a grassed football pitch, a play park and a hardcourt basketball and five-a-side football area. The Social Centre Playing Fields include Bromham F.C. 's football pitch and a smaller pitch that is used by the youth team. Just by the car park of the Social Centre is another children's play park which is overlooked by the Millennium Cross: a tall stone cross erected in 2000 and recording the village's Christian heritage. Bromham Football Club was founded in 1897 by Harry Amor and Arthur Powney. There is a bowls club that meet every week at the Social Centre to play indoor bowls on special mats that turn the dance floor into a bowls green. At the Pound Playing Field there is a tennis court available to hire. Bromham Carnival is held each June for two weeks. It comprises village-wide events, opening with the choosing of the Carnival Queen, Butterfly Princess, Princess and Prince. The events then continue including quizzes, bingo, treasure hunts and much more. On the final Saturday of the two weeks the carnival procession is held, commencing usually at 2.00pm from the Pound Playing Field and winding its way through the village to the Social Centre Playing Field where activities and shows take place throughout the afternoon. For the past few years, the carnival has been followed by the locally organised show: "Bromfest". Bands from the local area play from 5.00pm through until 12 midnight and mark the end of the carnival period. "Bromham". Wiltshire Community History. Wiltshire Council. Retrieved 6 March 2016. Crowley, D.A. (ed.). "Victoria County History – Wiltshire – Vol 7 pp179-186 – Parishes: Bromham". British History Online. University of London. Retrieved 6 March 2016. ^ "Wiltshire Community History – Census". Wiltshire Council. Retrieved 13 September 2014. ^ John Marius Wilson, Imperial Gazetteer of England and Wales 1870–72. ^ "Bayntun History – Bromham House". Retrieved 13 September 2014. ^ a b "Andrews' and Dury's Map of Wiltshire, 1773". Wiltshire Community History. Wiltshire Council. Retrieved 13 September 2014. ^ Crowley, D.A. (ed.). "Victoria County History – Wiltshire – Vol 7 pp187-197 – Parishes: Bishop's Cannings". British History Online. University of London. Retrieved 6 March 2016. ^ Historic England. "Church of St Nicholas (1033887)". National Heritage List for England. Retrieved 6 March 2016. ^ "Church of St. Nicholas, Bromham". Wiltshire Community History. Wiltshire Council. Retrieved 6 March 2016. ^ Pevsner, Nikolaus; Cherry, Bridget (revision) (1975) . Wiltshire. The Buildings of England (2nd ed.). Harmondsworth: Penguin Books. p. 148. ISBN 0-14-0710-26-4. ^ "Church of St. Nicholas". bayntun-history.com. Retrieved 6 March 2016. ^ Historic England. "Sloperton Cottage (1033858)". National Heritage List for England. Retrieved 6 March 2016. ^ "Bromham Methodist Church". Wiltshire United Area. Retrieved 6 March 2016. ^ "Baptist Chapel, Bromham". Wiltshire Community History. Wiltshire Council. Retrieved 6 March 2016. ^ "Chittoe Heath Methodist Chapel". Wiltshire Community History. Wiltshire Council. Retrieved 6 March 2016. ^ "Chittoe Heath Primitive Methodist chapel". My Primitive Methodist Ancestors. Retrieved 6 March 2016. ^ "Melksham's new Rev to reach out to all age groups". Wiltshire Times. 13 September 2013. Retrieved 6 March 2016. ^ "Image of St. Mary, Chittoe". Wiltshire Community History. Wiltshire Council. Retrieved 11 May 2011. ^ "Church of St. Mary, Chittoe". Wiltshire Community History. Wiltshire Council. Retrieved 13 September 2014. ^ Historic England. "Battle House (1033892)". National Heritage List for England. Retrieved 5 March 2016. ^ Historic England. "Spye Arch Lodge (1033912)". National Heritage List for England. Retrieved 5 March 2016. ^ Historic England. "Nonsuch House (1033860)". National Heritage List for England. Retrieved 5 March 2016. ^ "Bromham, Rowde and Potterne ward 2011". Retrieved 11 March 2015. ^ "St Nicholas VC Primary School". Retrieved 13 September 2014. ^ "St. Nicholas Church of England (VC) Primary School". Wiltshire Community History. Wiltshire Council. Retrieved 6 March 2016. ^ "British School, Bromham". Wiltshire Community History. Wiltshire Council. Retrieved 6 March 2016. ^ a b c d e "Village Website". Archived from the original on 13 September 2014. Retrieved 13 September 2014. This page was last edited on 16 December 2018, at 20:25 (UTC).